Notre Dame cathedral in Paris is engulfed in flames, and it’s not clear if the iconic structure can be saved. It’s time “Get More Smarter.” If you think we missed something important, please include the link in the comments below (here’s a good example). If you are more of a visual learner, check out The Get More Smarter Show. …congressional Democrats have been sharply critical of Barr’s handling of the Mueller report, accusing the attorney general of soft-pedaling the findings to protect the president. The House Judiciary Committee is poised to issue a subpoena for the report’s redacted portions. Multiple polls show a majority of Americans don’t think they got a tax cut at all — even though independent analyses show they did. And only about a third of the country approves of the legislation itself, the Tax Cuts and Jobs Act, passed by Congress at the end of 2017. White House officials are clearly aware of their vulnerability on the issue and officials are dubbing this Tax Cut Week, sending the president out to tout the impact of the legislation starting in Minnesota on Monday. On the subject of taxes, White House Press Secretary Sarah Sanders is now saying that Trump’s tax returns shouldn’t be released because they are just too complicated to understand anyway. ► The recall grift in Colorado just keeps growing and growing and growing. ► Check out the latest episode of The Get More Smarter Show, featuring an in-depth interview with Colorado Attorney General Phil Weiser. ► Voters in Denver will receive mail ballots in the coming days in advance of a busy Spring ballot. The Denver Post runs down the candidates and issues battling it out in Colorado’s Capitol. Republicans on Capitol Hill are raising alarms at the White House’s resistance to congressional demands, fearing President Donald Trump is bolstering the power of his office at the expense of Congress. The White House has stonewalled House Democrats on nearly all aspects of their sprawling investigations into the President, refusing to provide documents as requested by committee chairmen, preventing former White House officials from complying with Democratic demands and fighting subpoenas pertaining to the US Census and the administration’s handling of the security clearance process. …While there’s historically tension between the Executive Branch and Legislative Branch, even Republicans acknowledge there’s a key difference in this situation: The President is ignoring Congress, and often federal law, to try to achieve his objectives. [Pols emphasis] The Trump administration has pointedly blown off bipartisan demands to comply with federal law to determine the role the Saudi crown prince played in the murder of a Washington Post journalist. Before you get too optimistic about Republicans checking Trump, consider this comment from Colorado Sen. Cory Gardner (R-Yuma), which rings as hollow as any of his previous statements: “I think there will be continued pressure from Congress to do more,” said Gardner. More than 200 lives have been claimed in American school shootings since the massacre at Columbine High School 20 years ago this week. That total doesn’t include hundreds more murdered in mass killings in nonschool settings, such as the 2017 Las Vegas shooting(58 killed) or the Pulse nightclub massacre in Orlando, Fla., the year before (49 killed). Yet the ability to contain the loss of life from these tragedies remains stalled, as Second Amendment defenders and gun control advocates continue their faceoff in what has become an ossified and depressingly familiar impasse over gun violence in this country. ► New polling data on the field of candidates vying for the Democratic Presidential nomination shows Vermont Sen. Bernie Sanders leading the way. ► It’s a good bet that University of Colorado Regents will long be explaining the process for determining their “sole finalist” to be CU’s next President. ► Denver Mayor Michael Hancock responds to President Trump’s proposals to ship migrants into “sanctuary cities” across America. House Democrats, meanwhile, are taking a closer look at internal administration discussions about the proposal. ► Westword profiles freshman Rep. Joe Neguse (D-Lafayette) and his ambitious first couple of months in Congress. The host of a fundraiser for U.S. Sen. Cory Gardner has, in recent years, lobbied the Senate on behalf of Middle East banks as they opposed sanctions on the terrorist group Hezbollah. …Between 2016 and late 2018, Korologos lobbied Congress on behalf of the Association of Banks in Lebanon, according to federal lobbying disclosure forms, and advised his clients on two pieces of legislation that eventually became law. One sanctioned Hezbollah and its supporters; another made it easier for American victims of terrorism to sue foreign governments that support terrorism. His clients in the Middle East were opposed to both bills. ► Attorneys for Donald Trump are warning an accounting firm not to disclose information about Trump’s tax returns. ► President Trump is increasing his attacks on Rep. Ilhan Omar while House Speaker Nancy Pelosi worries about the safety of Omar’s family and staff. ► As the New York Times reports, President Trump is using his brilliant negotiating “powers” on trade to undercut himself at every turn. ► As Vox.com reports, support for legal marijuana in the United States is at an all-time high. ► Governor Jared Polis signed into law so-called “red flag” legislation on Friday. Click here for The Get More Smarter Show. 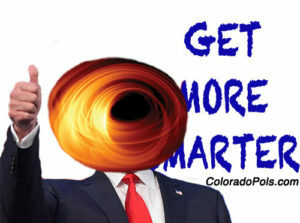 You can also Get More Smarter by liking Colorado Pols on Facebook! America’s best and brightest orangest to the rescue . . . The French authorities, in an apparent response a tweet by President Trump that suggested using “flying water tankers” to stop the fire, stressed that the use of firefighting planes was too dangerous for the cathedral.
. . . anyone wanna’ take bets on whether he 3:00 a.m. tweets something about “the French shoulda’ raked their leaves”??? I like the White House Chief of Staff's rationale better. He essentially said, "Hey, y'all knew (or at least suspected) back in 2016 that Trump was a tax cheat when he refused to release those returns, but y'all elected him anyway." It's kind of a double reverse res judicata argument. Nor would they be smart enough to retain a tax attorney either, apparently. This is government by low-rent troll.